Artificial Intelligence; where to start? - Vanguard Marketing International, Inc.
We begin with an imagination and a great problem in search of a disruptive solution that is solvable within the constraints of the situation. We do not begin with the balance of power or ending world hunger. 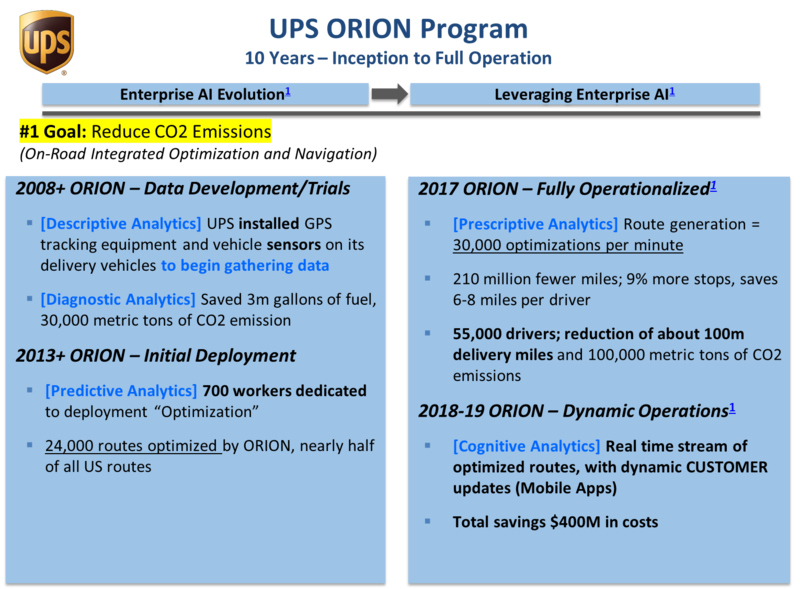 When people think of AI sometimes they think of the decades of unfulfilled promises. After all AI has been around for a long time and periodically it pops to the top of people’s minds. It becomes an intense topic of debate, only to drift back into the background because we’re frequently told, “it’s just around the corner.” The issue has been that we can imagine far more than technology was able to produce which made things less than interesting or useful. But AI has been progressing all this time and thanks to large investments, people who committed themselves to the problems along with the maturity and convergence of some amazing technologies. AI is finally getting to the point that it can actually enable some of the things we imagine and some that we haven’t. So now the challenge becomes applying our imagination to issues that we never thought of but could be amazing if we did. What are the really big issues hidden in plain site that you have taken for granted possibly all of your life? Simply because you never really thought about them. History is full of examples where a person is confronted with a question or situation that makes them stop and think a bit leading to an amazing, history-changing breakthrough. History is full of stories where one day someone stopped and asked – What if? Dr. Edwin Land, founder of the Polaroid Corporation, was out with his family and took an occasion to take a photograph of his daughter in the park. She then asked to see the picture. Dr. Land was startled at the question but as he thought about it, his reaction was – Yes, why can’t she see the picture. Based on that simple question from his daughter, Dr. Land then went on to become the father of instant photography. Just because its so, doesn’t mean it needs to be. In keeping with Dr. Land and photography, suppose you have a bunch of old images. Maybe they are 1080p or even 720p quality, did you think they will remain that same quality forever? Contemplate if they were created today at 8K quality, what would they look like? Maybe you just wanted a better picture of grandma on the family farm, as an example. Thanks to Samsung, Google and others, you will be able to see things that were never imagined until now. In VMI’s white paper CES 2018 Best of the Best Highlights in Global Innovations, we look at the application of AI to enhance the resolution of images. 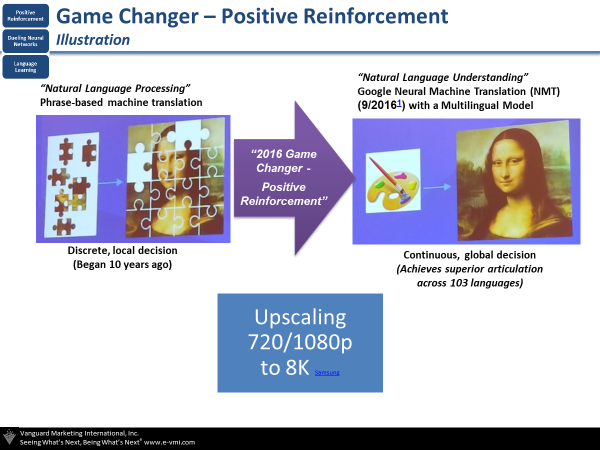 In the example, Samsung applies AI technology based on machine learning analysis and automatically upscales low resolution 720p and 1080p images into 8K quality. The concept referred to as “Positive Reinforcement.” See Google example above. With AI, as with many things, the missing ingredient isn’t the solution it’s the problem. Everybody has a solution in search of a problem but few have a problem in search of a solution. Those that begin with an imagination and look at “givens” as a something to accept vs. something to be explored and understood or maybe as a problem to be solved will find opportunities everywhere. The question then becomes where to start? Looked out the window lately? It seems like there is a new and large data center being built every day. So, when you think about their proliferation what is the major problem for any data center? More efficient ways to cool them. Since Google is a big player in data centers and in AI, it seemed only reasonable to have their exceptionally talented AI company, DeepMind (acquired in 2014) look into the challenge. The result being that through the application of DeepMind’s machine learning to Google data centers the company managed to reduce the amount of energy used for cooling by up to 40%. Following the energy savings success with the data centers DeepMind is now looking into the potential application at the UK National Grid level. “We’re early stages talking to UK National Grid and other big providers about how we could look at the sorts of problems they have,” Demis Hassabis, DeepMind’s cofounder and CEO. “It would be amazing if you could save 10% of the country’s energy usage without any new infrastructure, just from optimization. Now there is a challenge – save 10% of the country’s energy usage without any new infrastructure! One of our favorite examples is UPS and their journey over the past ten years. As you can see, they architected the journey with impressive goals at each stage. With each stage being a building block for the next. In AI terms, they began with descriptive analysis coupled with diagnostic analytics to achieve early but impressive results. As a result, this lead to the application of predictive analytics leading to even higher results against the initial goal. Armed with success and knowledge they then applied prescriptive analytics to the operations side of the business. They are now beginning to apply cognitive analytics to heavily differentiate themselves in the market and in the minds of their customers. Think about great problems and don’t just try to solve them with the standard tools at hand. Ask yourself – “what if?” AI is not about incremental improvement. In fact, AI is not an improvement in any sense of the word. It offers the promise of disruption. The top question our clients ask – “how can I be a breakout leader in that market in two to four years?” Our journey always starts the same way, with an important emerging problem and a “what if” question. How are you going to become a disruptor and create a solution no one ever thought was possible?